Cairo 2121. The city is failing. To save it, all they need is a list. A list that has the names needed to take down the slave cartel that targets orphans. A list that’s impossible to find. In an unfamiliar city, Imara attempts to secure the list, but her efforts are thwarted again and again by a man who grips Cairo with terror and control. She joins a security team, hoping to save Cairo and her new boyfriend’s business all at the same time. With the team’s numbers dwindling more each day, they prepare for an upcoming event to attract new recruits to help them hunt down the list and stop the terror for good. Fix the mistakes of her past… or save the city? 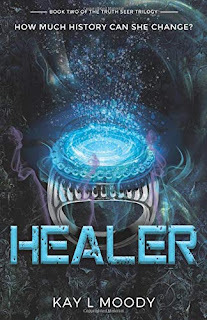 Healer is the 2nd book in the Truth Seer Trilogy. Healer was a well written book. It followed Truth Seer well and confirmed something I suspected from Truth Seer. I read it so much that I finished it the morning I started it. As with Truth Seer, all the futuristic stuff was a little confusing. We got a free copy of this book. All thoughts and opinions are our own and given voluntarily. No compensation was received for the review.